I’ve not written about tarot in a while so just wanted to get down a few things. I’ve not actually managed much tarot because I’ve been so tired and Aug was stained glass month. Did I tell you about that? 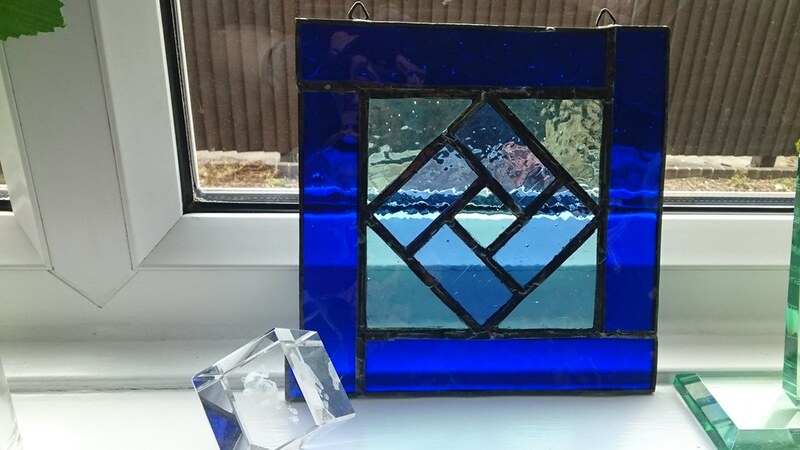 I did an amazing course with a fantastic and thoughtful teacher and made a piece of stained glass from scratch! Ok, back to tarot. I’ve almost reached the end of my sort of a card a week thing. It was inspired by Carrie Mallon’s memento mori post and I had wanted to blog about it each but that never happened. What did happen though was that I developed a deeper understanding of the cards. Each week I reflected on the previous card and how it had featured over the week for me. I also used it as an opportunity to read Seventy Eight Degrees of Wisdom for the card and I updated my little white book with what I had discovered. Mostly so that it would fit better with a year cycle, I only used the minor cards and some weeks drew two and others life took over and I didn’t draw any. This means that assuming I manage the remaining weeks, I will have completed the minors over the course of a year. I’m starting to think about how I can use the major cards, all 22 of them, this coming year (October to October). Had there been 24 I’d have perhaps drawn one at each full and new moon… Thoughts are welcomed! I am very excited about the Brady Tarot deck which is being created. It is drawing on natural history and uses print making which is one of my favourite forms of art. The images so far are beautiful and offer a lot of scope for getting to know the card as they are detailed and evocative. The images draw of North American flora and fauna and part of the profits will go to a conservation charity. They are clearly a work of love and passion and because of this, they are taking longer than expected, but I don’t mind at all. I love getting the updates and am excited about seeing all the cards! I recently had an email from someone who was reading my blog (I love emails, go for it if you want to get in touch!) and was wondering about whether the Alternative Tarot Course or 78 Mirrors would be best for her. As we were pinging emails, Beth from Little Red Tarot announced her new course which sounds amazing! I can’t comment on that as I’ve not done it but I thought it might be helpful for other people to hear about the other two courses. 78 Mirrors and the Alternative Tarot Course (ATC) are both great. And they are totally complementary. I did the ATC very early on in my tarot journey and the 78 Mirrors as a more established self reader and this obviously affects how I engaged with the courses. The first thing I would say is about money. ATC is considerably cheaper than 78 Mirrors and a lot of that is because they are delivered very differently. ATC is self guided so if you learn better on your own, or can’t commit to a set time scale course that might be best for you. 78 mirrors has more of a structure in terms of when emails get sent etc but if you get behind or whatever you still have all the info to catch up with. What you would miss to a certain extent if you couldn’t keep up would be the value of the facebook group (I joined facebook just for the group) which was good for getting other people’s ideas and things. Because of the number of people on the course and the way facebook groups work, I think if you got really behind in the course you’d find it hard to find the relevant bits of conversation and could miss out on the interactive side of things. 78 mirrors covers things more from a card by card perspective which builds up your own version of the little white book. On the other hand little red is more about helping you get to know the cards in your own way. for example she looks at the way elements interact with each other and what sort of a reader you want to be. I couldn’t possibly say which was best and as I think I’ve made clear, a lot will depend on how you learn and what time you have available etc. I’d love to hear from anyone who’s started Beth’s new course which is taking a card a day and could possibly be a sort of bridge between ATC and 78 mirrors. The final thing I wanted to mention was a post over on Little Red Tarot about using different decks to deepen understanding. This is one of the most powerful things I got out of Susannah Conway’s 78 Mirrors course. For the course, she advised we had a Rider Waite Smith (RWS) deck, a take on the RWS deck (in my case Tarot Of Pagan Cats: Tarot Deck) and a third more independent one (of course this was going to be my beloved Wild Unknown). I did not chime at all with the RWS deck but using it along side the cat deck helped me deepen my understanding of the cards and helped me to see the wild unknown cards from a different angle. There are so many decks out there that it can feel overwhelming and you can struggle to know which one to use. I trust my gut when I turn to my cards and whilst I almost always go for the wild unknown, from time to time I feel compelled to either combine it with another deck or use another deck entirely. It can be expensive but there are various tarot apps which can reduce the cost. Or if your hope is to compare cards and meanings, you could try one of the many many websites which offer interpretations as well as images of the decks. Week 2 of the Alternative Tarot Course looks at the four suits; Wands, Cups, Pentacles and Swords. I’ve read a lot about the suits but I thought it would be helpful for me to brain dump, or free write, what the suits mean to me. Partly as clarification for myself but also because being able to explain something to another person really helps you understand what you do and don’t know. There is no one ‘good’ suit. Like most things in life, it is about balance and moderation. Too much of most things can be harmful. It also depends on what else is around – the way the different suits and their corresponding elements interact. This is the suit I have less of a handle on which I think is appropriate as it is about things which aren’t tangible. It is a suit of energy, of passion, of ideas, of inspiration. Things which aren’t yet real. Beginnings. It is what fuels us. That spark of excitment when you get an idea. And like fire, it can be creative or destructive. It can fuel or it can burn out. This is the suit of emotion, love, relationships, the inner world. The depiction of the water or the cup can represent how you’re doing emotionally -is the water stuck, flowing freely etc? For example, the five of cups is sometimes shown as someone upset looking at spilt cups but not seeing the river behind them. They are focussed on their pain so tightly that they miss the positives. The mother of cups in the wild unknown deck has her wing above her cup. she is protecting her emotions but she isn’t stiffling them. This suit is also associated with creativity and expression through arts, music etc. The nitty gritty, day to day stuff. The things you can actually grasp. Like money, resources, jobs but also less tangibly, health and the body. The eight of pentacles is all about craft and honing your skills and using your hands (whether that’s literal or not) to create real things. Concerned with the material world, this is sometimes called the coin suit instead. Thoughts. Where the cups are the inner realm, swords are the mental realm. They are knowledge, truth, communication. They are often linked to construction and destruction. Looking at how the suits play with each other has been a really helpful part of my readings over the last year. I always look to see if a particular suit dominates and if so, what other cards are in the mix. How do they interact? As an example, you may have a wand and a cup, fire and water. Now fire and water can interact in different ways; fire can heat the water or water can put out the fire. In terms of the suits, this could be read as the wand adding energy and excitment to the emotional cups card, or is the cup too emotional and that’s causing the idea to fizzle out? This was something that took a bit of thinking out for me and whilst it isn’t always relelvant to a reading, it is a useful tool. You might also notice more than one element portrayed in a tarot card, if so, look at how they are interacting in the image. This can tell you a lot about a card and its meaning. 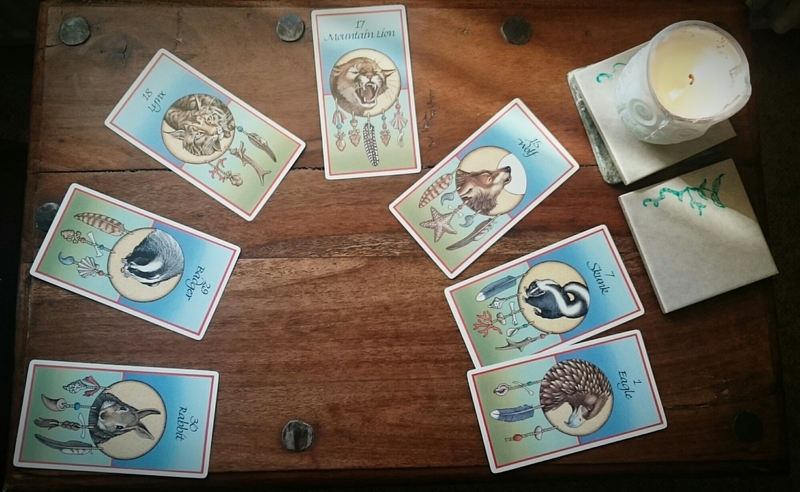 At the beginning of the year I completed the wonderful Alternative Tarot Course from Beth over at Little Red Tarot. As I mentioned back then, it’s a great course which Beth provides at a very accessible price. I got a discount through her newsletter so only paid $20 but full price it’s only $25. It’s designed to cover 8 weeks but as a learn at your own pace course, it’s obviously very flexible. And you get possibly life long access. At least I can still access it now! So, it’s been one hell of a year. My life looked so incredibly different when I first started the course back in January. It was my first venture into learning about tarot in detail. And I feel like it would be interesting to work through the materials again, in this new permutation of my life and with the tarot knowledge I have developed throughout the year. I had intended, the first time round, to blog about the course but time and life meant I didn’t really do this, or at least not as much as I’d have liked. Perhaps this time will be different. Week One: What kind of tarot reader do you want to be? I answered this in part in my 10 questions every tarot reader should answer post. The main answer is that I use tarot as a psychological tool and a way of communicating with myself. Beth provides a number of prompts and questions to help us explore our journey with tarot, our thoughts around the possibilities etc. How did you find out about tarot, what is the purpose of tarot etc. The reason I want to learn tarot is… as a tool for connecting with myself, as a method of self care, as a way of meditating and being mindful, as a way of listening to myself and of caring for my mental health. I wrote that in January and to be honest, my reason for wanting to read tarot hasn’t changed. I still use it to connect with myself, to check out if my needs are being met, as a way of listening to myself and a way of carving out a space and time for my emotions. I do think I have found a way of listening and hearing myself through tarot. However, I know that I often listen and then don’t act on what I’ve heard. So I might realise I need to get out the house more but then I willfully forget that discovery and not actually get out the house more. That’s a rubbish example but I hope it illustrates the point! I also know I need to look at ways of using the cards to validate my feelings and experiences. I think my main challenges will be… maintaining a routine, reading and putting in the effort on bad days when my depression is worse, physical challenges because of my hands. 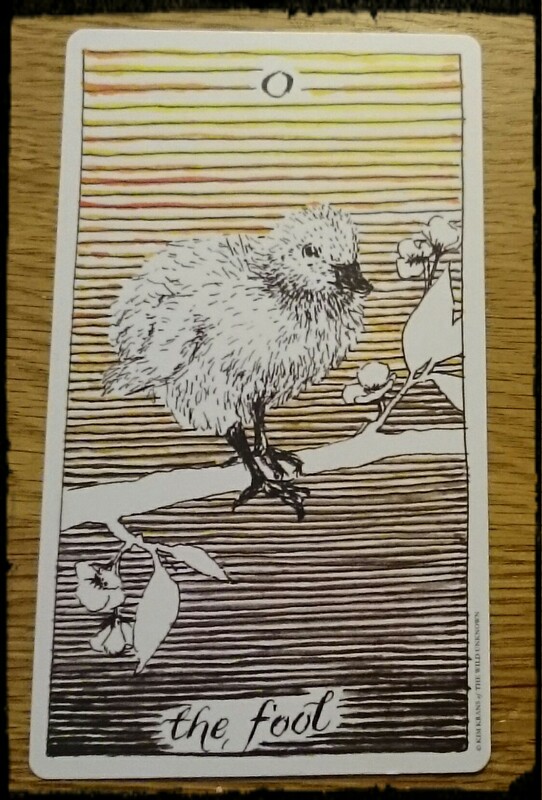 But I will try to overcome them by… keeping the cards nearby, working through this course, signing up for newsletters etc about tarot so that there are lots of reminders and reading isn’t a hard thing, letting other people handle the cards whilst I read them for myself. Having retired, some of the physical challenges have lessened as I am no longer using my hands all day at work. 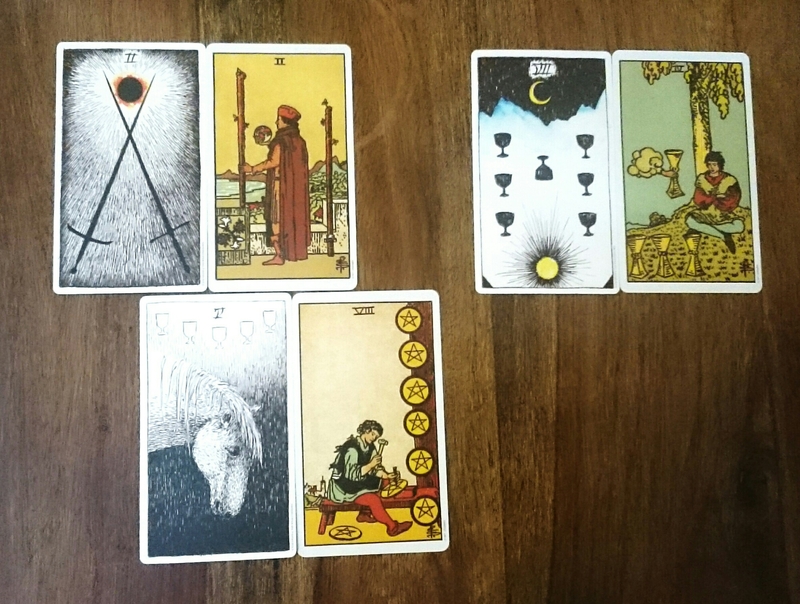 I have been reasonably good at using the moon cycles as a way of maintaining a tarot routine. I do read at other times but I almost always do a reading on a new or full moon. I have also recently started drawing a card a week, a sort of riff on the Memento Mori that Carrie Mallon is doing. My tarot cards are in my eye line when I’m in my living room chair and given that I spend most of my time there, this works as a helpful reminder. It also means I don’t have to put much effort in to getting cards out etc. I have subscribed to a number of newsletters and as well as the Alternative Tarot Course, I have done Susannah Conway’s 78 Mirrors this year. Taking up tarot can be expensive. There’s the cost of the decks which vary dramatically (my beautiful Wild Unknown deck was £34 and I felt I had to get the book as well as i was a beginner, another £16); the cost of books for general information as well as specific books for specific decks; the cost of courses ; the cost of getting readings (which can be a helpful way to learn). This blog post was prompted by someone finding my blog by Googling “alternative tarot for someone with no money” so here are my thoughts on ways you can learn and practice tarot without the high price tag. Some decks are cheaper than others but you can also download and print some decks eg from Dark Tarot, through Etsy or David’s Tarot. Print them on card (or glue onto card) and you have a very cheap deck. If you want a professional printed deck, you’ll find Rider Waite Smith decks cheap online or even in second hand or discounted book shops. However, if you can, I would recommend waiting for a deck that leaps out at you and asks to be taken home. My wild unknown deck was expensive but I use it most days and I love it more than all my other decks and connect to it much more strongly. So for me, it has definitely been worth the cost. I wouldn’t have got anywhere near as much insight if i’d started with the Rider Waite Smith deck and possibly wouldn’t be so into tarot. Other tarot readers are a good source of second hand decks – they’re so tempting that often people buy lots and don’t click with them all. Indeed one of my fellow students on 78 mirrors has offered to sent me their Lumina tarot deck which they’ve not clicked with. Another way to dramatically reduce the cost of tarot is to get a tarot app instead. There are some good ones and a few do a free tester version so you can see if you like it. Galaxy Tone seems to have a good reputation. Other than the Wild Unknown book, I didn’t buy my first tarot book until a few weeks ago. There is a vast amount of great information online so I haven’t needed to. The book I have bought is one which I’ve seen recommended over and over again, Carrie recommended it when I asked for her suggestions and its come up again in 78 Mirrors. 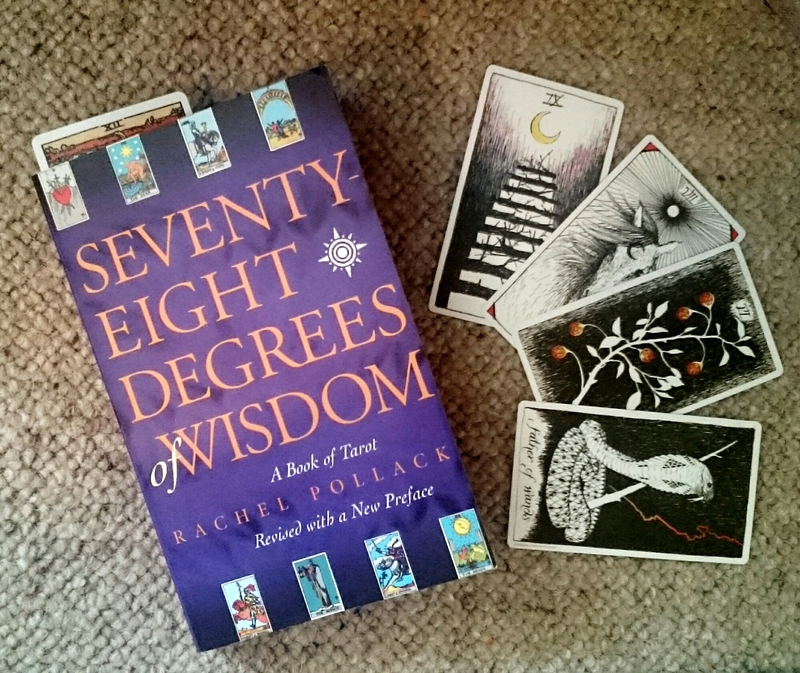 It’s 78 Degrees of Wisdom by Rachel Pollack and seems to be a bit of a tarot bible. My copy is 350 pages starting with a bit of history before moving onto the major arcana, the minor arcana and then readings. It was first published in 1980 in two parts. I’m onky up to page 73 (the strength card) but so far it’s very informative, very readable and very helpful. She goes into a lot of detail about each card and looks at the imagery and symbolism (predominately that in the Rider Waite Smith deck which is helpful for other decks as well). I don’t know much about myths, religion and symbology so I’m finding it quite illuminating. My copy was about £5 from amazon but given its popularity I would expect to find it in charity shops as well (side note, I would prefer more charity bookshop shopping but so many of them round here have steps or are too tightly packed to get a wheelchair round. If you run one, check on how accessible you are). There are other amazing looking books out there about tarot that you might really want, but if you’re strapped for cash, you really don’t need them. Again, you don’t need to do a course but they can provide a structured approach and possibly other learners. I haven’t done it but Susannah Conway’s Daily Guidance course is supposed to be very good, although it is pricier at £67. Her second tarot course, 78 Mirrors is £117 and is very good so far. These do have an optional Facebook group for peer support and Susannah has posted a lot in there herself. If you sign up to her newsletter you get alerted to new courses and often a discount code. There are other courses available free via regular emails etc including learn tarot and The Tarot Lady. I subscribe to a number of tarot websites and get emails from time to time. Last night, I received one from Lavender Moon which included an article about the ten questions every tarot reader must answer. The idea is that it’s a way for potential clients to get to know your approach and your style of tarot reading. I found it interesting as I did a similar exercise as part of the fantastic Alternative Tarot Course at the beginning of the year and the beginning of my tarot journey. 1.Were you mentored, or were you self-taught? I’m self taught, through blogs and Google mostly. I’ve taken Beth’s Alternative Tarot Course, and part way through 78 mirrors. Prior to learning tarot, I’d never had my cards read. I recently bought a reading by Carrie Mallon and I know it’s something I’ll do again (another reading from Carrie and one from Beth are on my radar for the future). Tarot reader. I don’t know what I believe around psychics. Other than there are definitely a lot of frauds. Rationally I want to say they don’t exist but I’ve had my own weird experiences including feeling my sister’s (very specific) pain on a number of occasions despite there being no way I could have known about it at the time I felt it. I’m trying to be more open minded and I know I believe in the power of all that’s good in the world and the synchronicity of the universe. I believe strongly in self determination and as such I can’t predict anything. However I do believe that once you’ve done a reading, your mind looks out for things related to it, thus making it more likely that what you’ve read in the cards will be noticed and “come true”. I tell you I see a tall man in the cards, the next time you see a tall man it will have added relevance so you’ll note that he’s a tall man and then perhaps place meaning on him. I think tarot tunes you into your world more sharply. It helps you to see patterns and notice details. I think, as is human nature, we are prone to believing the good predictions and disbelieving the tough ones. But for me all the cards can be positive or negative, I don’t read reversals, instead I read each card as the positive and negative and see what chimes best with its position, context and where I am mentally and physically. Sometimes “negative” cards are something which has happened or will happen and other times they’re a warning of what could happen. I use tarot and oracle cards as well as using crystals for setting intention. I’m interested in runes although I’ve not done much (very little) research into them yet. I am interested in herbalism and am waiting impatiently for my horrid neighbours to leave so I can plant things in our shared yard (if I did it now, their dog would wreck things and I don’t like being in the yard in case they come out, they are not nice people). I’m trying to follow moon cycles and seasons but am not doing as well as I’d like yet. Both. Your head interprets how you see the images and what jumps out at you on a given day. The cards can include beaut, incredibly detailed images which clearly have a message. It’s like the image is a phrase in a language you don’t speak and the reader is the translator (when reading for another person, otherwise you’re translator and receiver). Both, depending on the time and place and what’s happening. I do like to problem solve but I’m getting better at stepping back and letting the other person lead. I’ve only done a couple of readings for others and they’ve been free. Due to complicated, stupid rules, any money I earn will go straight out of my bank and into the hands of the government. But that’s a different post. My point is most people can’t do readings for free and nor should they but as it makes no odds to me, providing I’m not undermining people who do get paid, I will read for free. So I’m thinking friends who wouldn’t turn to a paid reader cos they aren’t interested enough or can’t afford it or whatever. Everything but in particular I don’t like readings about a third party. It’s either me and me or me and the querant, I don’t want to read about someone for someone else (eg does he love me, is she cheating…). You put so much of yourself into readings the way I do them that third party readings just don’t make sense. Think of tarot as a conversation between you and the cards, that doesn’t work if the person doesn’t know they’re in the conversation! If you want a reading from me, let me know but bear in mind I’m a beginner and I have a chronic pain illness and fatigue so it may not be quick! You may remember back at the beginning of the year, I chose the word peace for my year, a la Susannah Conway. So, three months on, how am I making space in my life for peace? Well, firstly, I guess it’s expanded. The underlying essence is still about making a life more peaceful but it’s uncurled to include exploring spirituality, getting in touch with myself, getting in touch with nature, the seasons, the moon, the stars etc and doing lots of creative stuff. It also includes letting go of judging myself, building up self care routines and letting go of things I cannot control. If I am waging war on myself, I can never been at peace. I have a pinterest board which is helpful in reminding me that I am cultivating a more peaceful life as well as for pulling together ideas to explore. I am doing regular tarot readings and I’ve completed the Alternative Tarot Course which was really interesting and helped to develop and hone my skills at reading the cards. As I’ve mentioned before, this is a really good way for me to check in with myself and figure out what’s going on in my subconscious. I’ve also got a pack of beautiful medicine cards, I’ve not used them much but the idea is the same. I have got a few crystals which I’m using to set intentions and to help me remember those intentions. For example, I had an important meeting this morning and I wanted to be calm, articulate and level headed. Last night, I lit a candle, held the crystals and said that was my intention for the meeting. I put the crystals in my pocket and they just acted as a reminder. So when I started to ramble, they prompted me to stop, breathe and start again more clearly. I’ve had weekly check in sessions with myself, mostly at a local cafe. I have a stack of question cards to use as prompts to help me reflect on the week, how I’ve coped, what went well and the week ahead. Ensuring I keep space in my week for this is really important in helping me to process emotions and keep my life ‘peaceful’ or more balanced. As part of my checking in with myself, I have also done some work around fighting (systems mostly) and trying to find a way of moving out of the state where fighting is my default mode. I’ve done some work to let my ‘inner warrior’ rest whilst knowing that when I need to fight, she’ll be there (and be well rested). Staying on fight mode is not sustainable. Its not a criticism of myself, I had hell of a lot of things to be fighting for; house, wheelchair, work, physical health care, mental health care, benefits… so many things you’d normally take for granted… But I have a house, I have a wheelchair, I’m going through the process to leave work so I’m in a much better position now. Cultivating peace is also about the little things, noticing a bird singing outside the window or managing to find the time and energy to read and enjoy reading. Challenges to my peace include the upstairs neighbours’ dogs. There are two and they bark whenever their owners are out. When I catch myself tensing up and getting particularly irritable I notice it and physically uncurl and take a deep breath. The dogs are still annoying but I’ve interrupted my unconscious reaction which helps stop it from building. I think knowing my word is peace is helping me to notice when I am getting wound up by this kind of thing. I know I have a long way to go with this but I do feel I’ve made progress since I set the intention to bring more peace into my life. Did you set any intentions at the beginning of the year? How are you getting on? Apparently the Major Arcana are said to tell the story of the Fool (card 0) and part of the Alternative Tarot Course is to look at the cards and find a story. Here’s my, almost complete, story. The more experienced of you will notice that I have missed the last four cards. When I reached the Star card, it felt to me like pushing the story would be a bit like the time when I was 7 that I wrote “and they walked for a day and slept for a day and then they walked for a day and slept for a day…”. It felt like I was trying to pull out the story just to make it longer. NB. This is using the Wild Unknown cards which I believe have Strength and Justice in a different place to some decks. The Fool starts off naïve, innocent and curious about the world. As she starts to look around her, she meets five interesting people. The Magician is exciting and inspires in her a sense of purpose and a need to get moving and doing. The High Priestess tempers the Magician with her calm, collected and reflective aura. Where the Magician is full of energy and dives into new projects, the High Priestess prefers to consider and looks within for answers. The Empress and the Emperor make a powerful pair. Sometimes considered to be Mother Nature, the Empress is a warm woman who creates and nurtures life. The Emperor is more of a traditional stereotypical father figure who wants to protect life. He is more logical and mind focused where she is more focused on caring and emotions. The final person of the five is the Hierophant. He is a Wise Man who has spent many years reflecting and thinking about the world and is full of teachings that he enjoys sharing. The Fool respects and admires him. In fact, she builds strong friendships with the five people she has met, each offering a different aspect of support and as such, she experiences the union, partnership and joy of the Lovers. After this, the Fool starts to experience the world and sets off on her path. Setting out with the action of the Magician in mind, she is filled with purpose and adopts the strength of the Chariot. However all adventures reach a point where decisions are required or karma unfolds. As Justice makes itself known to the Fool, she decides it’s time to make use of her friends the High Priestess and the Hierophant. Pulling on their reflective ability and knowledge, she learns about the Hermit, his life of solitude, self reflection and meditation. Still overwhelmed by the looming decisions, she spends a period in solitude, reflecting and meditating on her life so far. Her meditation leads her towards the Wheel of Fortune and she realises it is necessary to change course, to move towards her destiny. Stepping off the easy path takes courage and strength and the path she has chosen is often unclear and unnerving, to continue on she must be patience and master her emotions so that she doesn’t lose faith and revert back to the easy path. She also feels the Hanged Man pressing on her. Changing course, however minor, requires letting go of a future you had envisioned, more dramatically, it can require letting go of believes, friends and security. However this is necessary sacrifice, a necessary death. Once she makes the sacrifice, she is able to bring closure on the old path and use the energy spent battling the path to instead move forward more easily and transform into the version of herself she felt drawn to whilst living like the Hermit. As she does this, with the help of Temperance, she continues to heal her wounds from her old path. As with all stories, there comes a point where the balance is knocked and negativity enters. As she has walked on her new path, she has picked up glittering objects which have slowed her down and detracted her from her intention. She has become more focused in gathering shiny trinkets than following her path. Indeed, she has built herself a home of lures from the devil and no longer follows her path at all. Suddenly, her home is robbed, all her shiny trinkets are stolen and she has no place to live. She is panicked and in her crisis, she turns to her five friends. It is the hierophant who reminds her to take a step back, reflect and meditate as she had done earlier in life. He guides her to the wisdom of the Tower. Through doing this, she realises how off course she has become and vows to find a way back. The crisis has forced her to look up and around her, and she now sees the shiny, glittering stars, trinkets which she cannot collect and which instead she can use to guide her. Reassured by this, she sets out again, with hope of her new life and peace of mind that the stars will show her the way. I just got my deck out to photograph the fool and some of the cards got stuck in the box, with the fool on top.